Posted in: Meetings, Misc. LEGO, ULUG News. Tagged: Building Challenge, Club Meeting, LEGO, Minifig. May’s club meeting is just arround the corrner. so cancel your weekend plans, get building and have some fun. Update: Polls are now closed Thanks for your vote! We will be drafting the new PoTC set Fountain of Youth. Building Challenge Theme: Micropolis, It’s your second chance to win prizes. This one sponsored by Mason, has a $1 Entry fee. 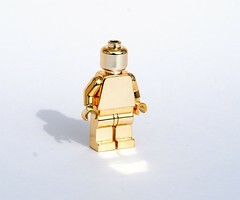 The winner gets this Awesome Gold Chrome Mini Fig. Check the forums for more of the Building Challenge Rules.